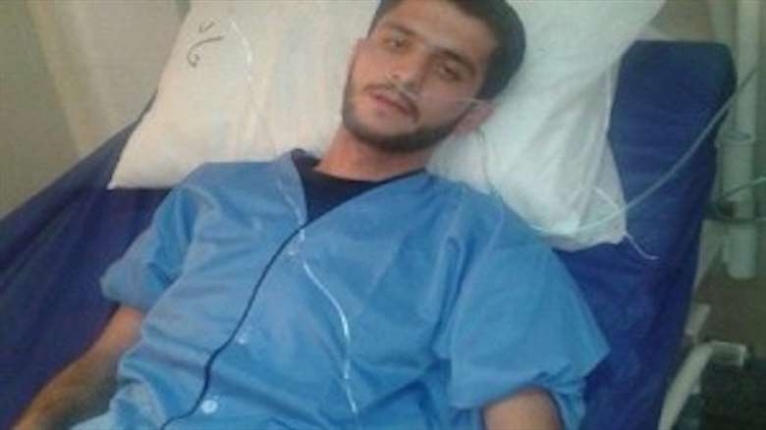 Afshin Sohrabzadeh, the 24 years old Kurdish man and political prisoner who exiled to Minab prison in Feb 2012, is at imminent risk of death due to intestine cancer and internal bleeding, BCR Group has learned. Afshin is in very dire health condition as he is suffering from intestinal cancer and internal bleeding. He is currently kept in Minab prison of Hormozgan Province. The political prisoner was transferred to the hospital out of prison for medical treatment due to an intensity of bleeding, but he was returned to prison twice without treatment by resistance of the Minab prison officials on June 1, 2016. Afshin has been frequently transferred to the medical centers out of prison, yet, he has not had an adequate medical care. Then, he returned back to prison without appropriate treatment, HRANA said. He, allegedly vomits blood, was deprived of having rights medical care, and so long as, the respiratory problems of him have been progressing, and his health condition seriously is in grave danger. The authorities confirmed his “colon cancer.” At least, once Afshin has survived from death because of his ill, the documents of Minab prison’s warden has clearly cited. Afshin had reportedly experienced severe tortures during his interrogation in the chambers by Deputy Intelligence Service of Kamyaran; his nose is broken. After much delay, some of the Iranian Human Rights organizations released a joint statement of the political prisoner concerning the excruciating life of Afshin Sohrabzadeh. Afshin, who is serving a 25-year-term in prison, was sentenced to imprisonment for alleged charges of “Moharebeh (enmity against God) through membership in one of the opponent Kurdish Parties known as Komoleh” at Branch 2 of the Islamic Revolutionary Court in Sanandaj City on June 8, 2010. He, born in 1990, was arrested by the intelligence authorities of Kamyaran near the dam of Gavoshan in the road on a coach on charges of fleeing the country to join one of the Kurdish parties on June 8, 2009, HRANA said. “Afshin Sohrabzadeh, a member of Iran’s Kurdish minority serving a 25-year prison term in “internal exile” at a remote prison in southern Hormozgan province, is in urgent need of specialized medical treatment outside prison. He suffers from a life-threatening gastrointestinal condition, exacerbated by prolonged lack of adequate treatment”, Amnesty International said. Finally, Afshin Sohrabzadeh was sent to medical furlough on June 25, 2016. THEREFORE: We, the undersigned, demand that the international community bring all possible pressure to bear upon the Islamic Republic of Iran to honor its binding human rights by IMMEDIATELY and UNCONDITIONALLY releasing Afshin Sohrabzadeh from the prison, canceling his ILLEGAL sentence and dropping all equally ILLEGAL charges against him. The Immediate & Unconditional Release of Afshin Sohrabzadeh, a Kurdish political prisoner petition to UN, Ban ki-Moon, OHCHR, Navi Pillay, Ahmed Shaheed, State Department, EU, European Parliament was written by Kaveh Taheri and is in the category Human Rights at GoPetition.